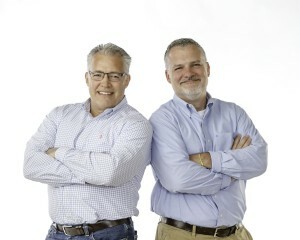 July 7, 2017 – Philadelphia, PA – Twenty-five years ago, brothers (pictured l-r) Dan and Jim Price decided to wield their Philadelphia-bred wit and love of broadcast to launch Oink Ink Radio, an audio only advertising firm. While the agency still maintains offices in New York City and Los Angeles, the brothers find themselves back in the city of Philadelphia. They write, cast , direct and produce radio spots and have created radio ads for some of the world’s largest brands including Google, CBS Television, Pepsi, Ikea, NBC, Verizon, Ford, Staples, Microsoft and literally hundreds more. The brothers, who grew up in North Hills, PA moved back to the area about nine years ago to be closer to their family and ailing father. According to Jim, it was a great move to come back to Philadelphia. “Philly’s down to earth. I appreciate the sensibility of folks around here. It’s funny that it’s a bit of a cynical and sarcastic city — and I mean that with the highest regard. People have a certain sense of humor, and I’d like to think that’s where mine came from.” And according to Dan, technology meant they were no longer physically tied to the other advertising markets. “There’s nothing like Philly and its work ethic,” he noted.